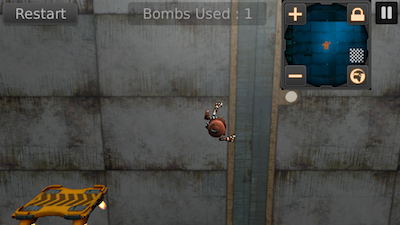 Rusty Robot (Free) by iVinny is a rag doll physics game that has one simple goal: move to the other platform. The way that you accomplish that goal is a little creative. 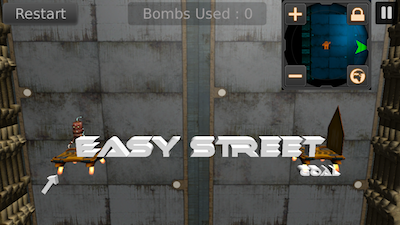 You’re going to create explosions that propel the robot in the direction you want him to go. You will blast him in a cold and calculated way. 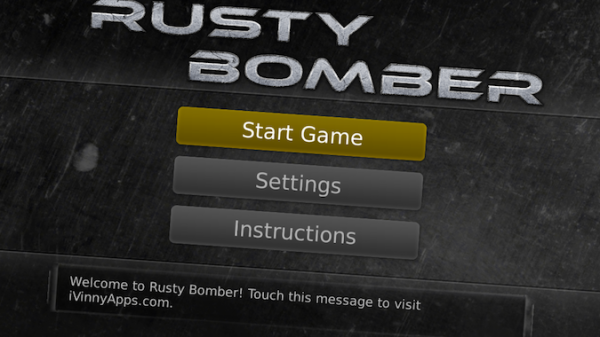 The instructions when you first open the app are a little confusing. Basically, you have two methods of causing explosions. You can hold and draw back for a well aimed blast, or you can tap on the screen for a quick explosion. Either method works. If you pull back while the robot is still in the air, it will activate slow motion while you aim. You can use as many blasts as you want to accomplish your goal. I’m sure that some of the levels I completed took a ridiculous number of blasts to finish. In the end, you’re given a rating to let you know if you used too many blasts. You get one, two, or three robots as a score. You don’t benefit from getting any particular rating. It’s more to let you know that there’s a better way to accomplish your goal. There are only 15 levels and one world. However, the levels are pretty intense. 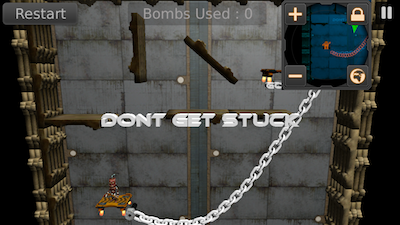 There are swinging balls on chains, chains roped throughout the room, and wooden obstacles that you need to get around. With so many things to get around, it’s helpful to look at the map in the upper right corner. 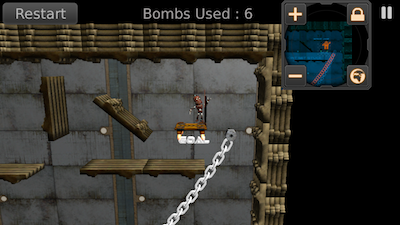 The red items can kill you, and the orange items are things that you need to maneuver around. You can tap on the world icon on the mini map to expand it. This gives you a better view of the area so you can plot your course. 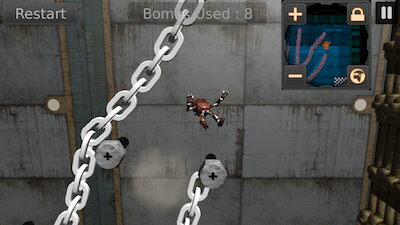 I love rag doll physics games. I like how unpredictable they can be. You could have the perfect course plotted out, but if your explosion is just a little off, the whole plan is ruined. It takes precision, planning, and a little luck to be successful in these games. 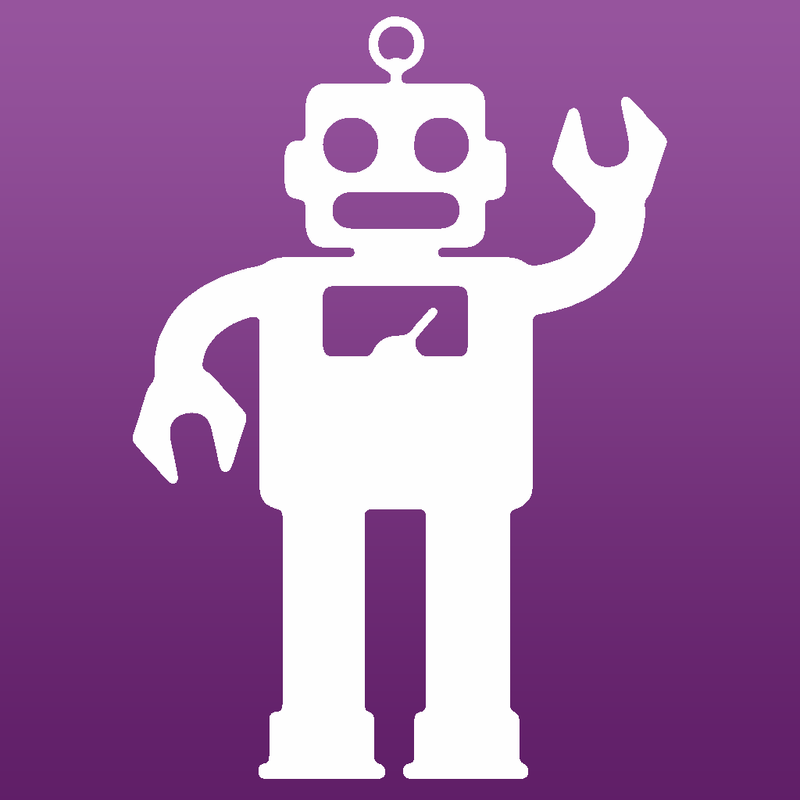 Rusty Robot is a universal app, and it’s available in the App Store for FREE!